Canadian Wildlife Federation: Good News! Wildlife crossing structures over the Trans-Canada Highway through Banff are heavily used by animals, even grizzlies have been spotted using them in broad daylight. The overpasses, which allow wildlife to cross the fenced highway, were criticized as expensive and useless, but have succeeded beyond expectations. Mary Majka who is a long-time advocate for the protection of wildlife and preservation of natural heritage, has been singled out once again for her years of work to preserve and protect an important bird sanctuary in her own backyard. Mary's Point Shorebird Reserve is one of the major stop-over points for two to three million shorebirds on their southerly migration each year. Researchers spent long nights in Grasslands National Park this summer in search of black-footed ferret kits; using spotlights to search for eye-shine from these nocturnal and rare creatures. Read the full story here. 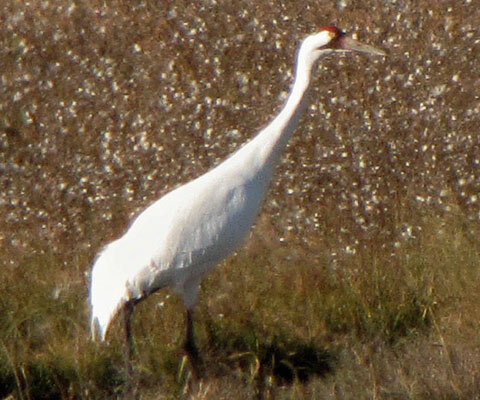 North America’s imperiled whooping crane population — which had experts in a panic just 18 months ago after nearly 10 per cent of the giant birds died in their wintering grounds in Texas — has rebounded after a banner summer season in Northern Canada where a near-record number of chicks were born. You can read all about it here. Scientists are pleased with polar bear population results from a recent aerial survey. The Government of Nunavut may decide to use aerial surveys to count polar bears in the future instead of more intrusive techniques which require the drugging and handling of the animals. Check out the story here.